Dr Konstantina Velkushanova, a Senior Research Associate in the Pollution Research Group (PRG) at UKZN, was recently appointed Deputy Chair of the International Water Association (IWA) Non-Sewered Sanitation (NSS) Specialist Group (SG) at the group’s official launch during the IWA World Water Congress and Exhibition in Tokyo. ‘The NSS specialist group is there to fill in a new niche in the water industry, which hasn’t been done in the past 200 years, and to start promoting that human waste is a resource that doesn’t need to be flushed and doesn’t need lots of water to be managed,’ said Chair of the NSS SG, Mr Jay Bhagwan from the Water Research Commission (WRC). The NSS SG held its first workshop on development in faecal sludge management (FSM) and NSS at the Congress, with contributions from experts from the United States, Japan, France, Sri Lanka and South Africa. In addition to a presentation from Velkushanova, Bhagwan gave a presentation on setting the scene for FSM and NSS. Dr Stanley Liphadzi from the WRC chaired the workshop. Workshop presenters shared practical developments and interventions, as well as new science and innovation in the area of NSS, which includes FSM. Velkushanova delivered a presentation about the challenges in the existing on-site sanitation systems including odours, poor user experience, safety concerns and potential environmental contamination. She said there was no uniform solution to addressing these challenges and approaches to finding solutions included onsite NSS systems, decentralised treatment technologies, and recovery and reuse of water, energy and nutrients. Velkushanova also presented on an engineering field-testing platform in Durban, which aims at the technical monitoring and evaluation of reinvented toilets performance in informal settlements, and collecting feedback from the community members that is crucial for the evaluation process. The contributions of Velkushanova and fellow experts, scientists and practitioners in the NSS SG will enable the generation, collation and dissemination of knowledge in the areas of NSS and FSM worldwide. According to the IWA, the NSS SG’s long-term goal is to introduce a new disruption around innovation and market process in the sanitation environment that will ensure both water and sanitation security. Providing knowledge to ensure the sustainable provision of sanitation services will, according to the NSS SG, improve the quality of life for millions of people using on-site sanitation systems and will contribute towards achieving Sustainable Development Goals target 6.2. Velkushanova joined the PRG in 2012 and has been actively involved in a number of water and sanitation projects, particularly in the field of FSM, some of which are funded under the “Reinvent the Toilet Challenge” and the “Transformative Technologies” programmes – which is funded by the Bill & Melinda Gates Foundation (BMGF). These deal with innovative technologies development and evaluation in collaboration with local and international partnering organisations. Other initiatives she is involved with are funded by eThekwini Water and Sanitation and the WRC in South Africa. Velkushanova is currently running a BMGF-funded grant involving development of a book, which is due to be published in 2019. The book is titled Methods for faecal sludge analysis. It is aimed at a globally standardised approach of faecal sludge analysis with international partners EAWAG, IHE-Delft and the Asian Institute of Technology. 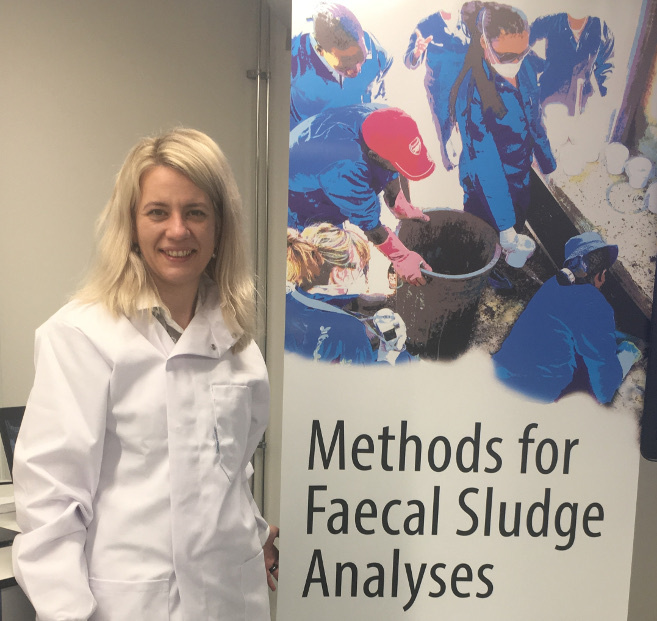 Velkushanova is also a member of the organising committee of the 5th International Faecal Sludge Management Conference to be held in Cape Town in February 2019.